When it comes to successful email marketing, it is evident that carefully worded calls to action must be married with incentive for the customer to convert. Consumers must be enticed to click through from the email message, enter the retail e-commerce website and make a transaction.. They must be provided with the assurance that their patronage is valued and that their satisfaction is of the company’s utmost importance. The internet is rich with “email marketing best practices” resources; articles, blog posts, software and how-to lists enlightening those interested in utilizing trigger emails as an effective marketing tool with vast amounts of information on the topic. Despite the wealth in available material, email marketers continue to commit trigger email faux-pas that extend beyond the realm of misspells and misplaced graphics. These errors dramatically reduce the possibility that website abandoners will return to their discarded shopping carts and make purchases. Don’t send your customers to search for the promotion code. 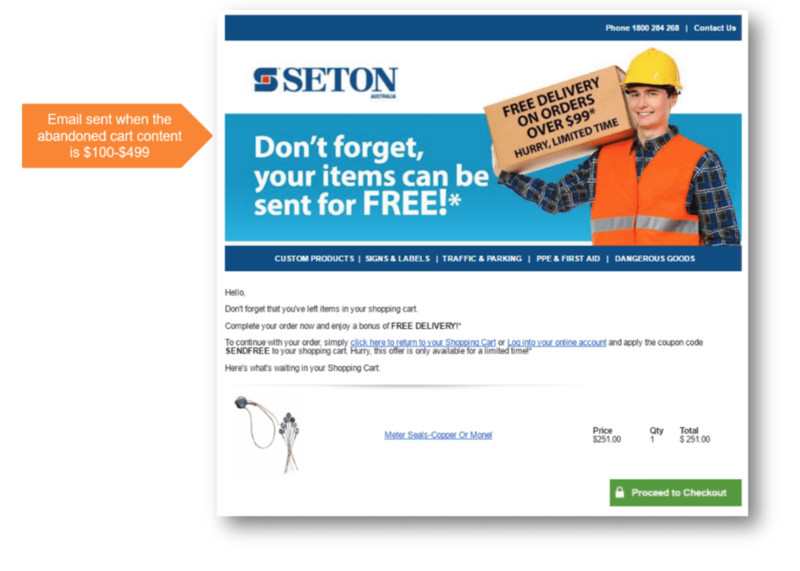 Presenting customers with promotional codes within the body of a trigger email may be enough to entice them to take another look at the retail e-commerce site, but it might not lead to widespread conversions among website abandoners if they must enter the codes manually upon checkout. 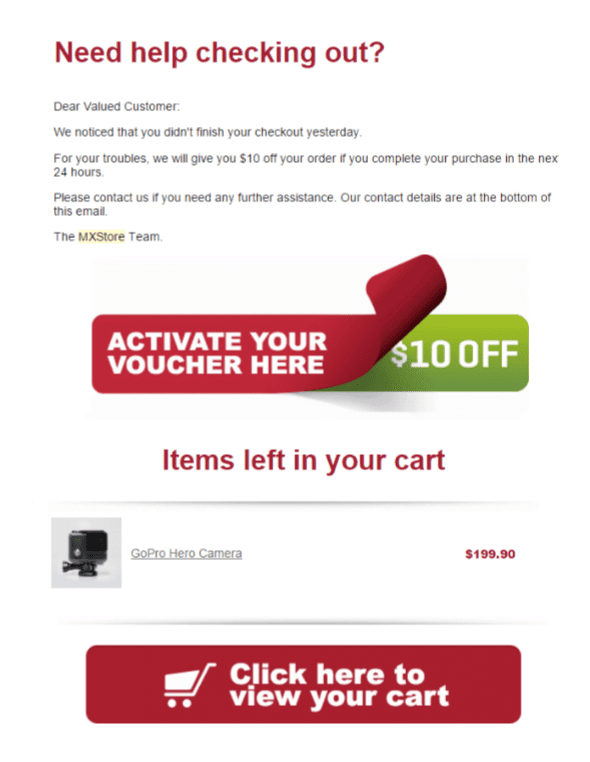 If the promotional code is difficult to remember, customers will be forced to keep returning to the cart abandonment email to search for the code, thereby unintentionally abandoning cart again. Alternately, they may forget that they received a promotional code and search for one on a coupon site, which may lead them to a competitor’s website instead. An additional problem with requiring customers to manually enter promotional codes is the danger of the codes being leaked to the general public and used by many new customers who never abandoned carts and did not need added incentive to make a purchase, especially if the promo code is overly simplified and easily remembered.. Instead, entice customers with auto-applied coupon vouchers. Emails containing coupons have a conversion rate increase of 27% . Embedding auto-applied coupon vouchers into trigger emails streamlines the retargeting process and encourages customers to follow through with the conversion process. Don’t settle for just one cart abandonment email. A study by Barilliance indicates that 18% of abandoned carts can be recovered by sending out multistage cart abandonment campaigns with some retailers reaching 40% conversion rates. Analysing cart abandonment campaigns of over 200 retailer sites worldwide, the study indicates that best practice is to send the first cart abandonment email within 1 hour of abandonment, the second after 24 hours and the third after 72 hours. Initial emails should, preferably, have a customer support tone, such an enquiring about potential problems the consumer may have encountered. Subsequent emails should have different subject lines and content, and retailers can create urgency to increase the chance of conversion. For example, announcing the upcoming expiration of the cart or that select items are back in stock. Most importantly, emails should contain calls to action that clearly prompt consumers to return to their cart. A best practice is to include an incentive in the third email. However, some consumers who learn that abandoning a cart will lead to incentives will purposefully leave the site until they receive an incentive to return. Consequently, while incentives are an effective method used to lure the customer back to the retail e-commerce site for the purpose of making a purchase, email marketers must ensure that proper promotion exposure rules are created to ensure that customers do not develop a dependency on the promotions and exclusively wait for email offers to reach their inboxes before making future transactions. Retailers should set up a long blocking time for emails that include a discount to ensure consumers do not develop the habit of waiting for an incentive. As such, incentives should not be offered at regular intervals and to the general audience, but segmented to specific consumers with predefined behaviors. For example, these emails can be segmented and a rule could be defined that would state that an incentive email would not be sent within a specified time frame from the consumer’s last purchase or to a customer who has already utilized the specific incentive. abandonment emails face a problem where shopping sessions don’t transfer between devices. Most cart abandonment emails include a link that should lead shoppers back to the site to complete the purchase. However, these links sometimes lead to an empty shopping cart page, leading customers to feel confused frustrated. These broken links are due to items being added to cart on a different device, and the current device is not aware of the previous cart items since it contains a different session cookie. A Barilliance study reveals that a full 30% of sales that originated on a smartphone were completed on a different device (desktop computer or tablet). That is, while the shopping session was initiated on a mobile device, the cart abandonment email was opened on a different device and the purchase was completed elsewhere. Similarly, over 40% of shoppers who finalized their purchases on a mobile phone actually began the session on a separate device, and over a third of those who began their sessions on a tablet completed them on other devices. To overcome the cross-device obstacle, retailers should use a cart abandonment solution that is able to present the abandoned products when the customer arrives to the site on a new device. Don’t treat all abandoners alike. 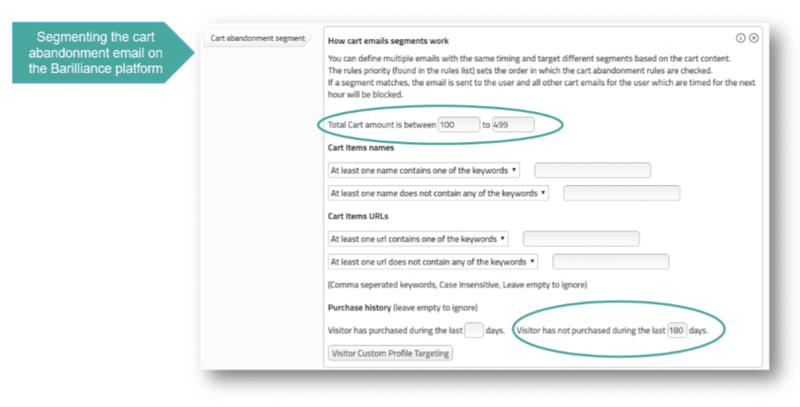 Leverage personalization to tailor the content of the cart abandonment email for different customers types. For example, abandoners with high value items in their cart can be offered a promotion of a higher value than the promotion offered to those with items of a lower value. Loyal customers with a high value purchase history can be lured back to the site to finalize their purchase with a special loyal customers discount. Other tactics to target customers would be offering customers who display a specific brand affinity product-specific discounts to boost revenue for a certain product or category. Sending out a trigger email from a generic or “no reply” address effectively tells customers that their business is wanted, but engagement with them is not. “No reply” emails hurt deliverability and facilitate customer unsubscription from captured email lists. Generic email addresses’ impersonal tone decrease conversion rates, thereby limiting business opportunities. Customers who abandoned carts would benefit from receiving trigger emails from a real address that enables interaction and thus promotes conversion. 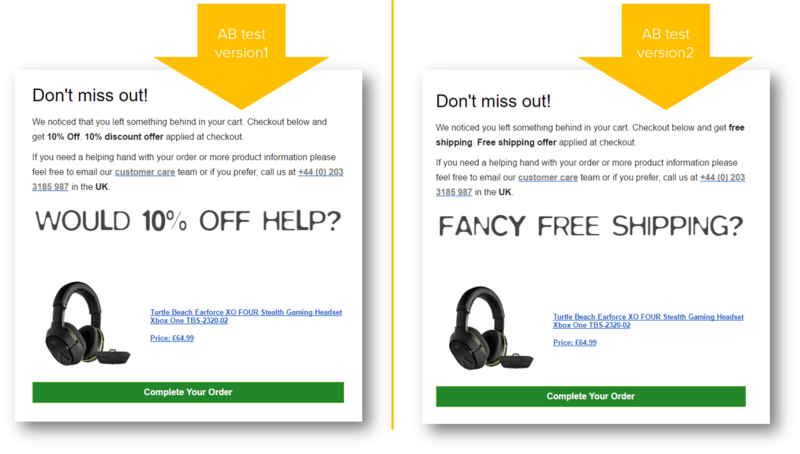 Retailers can increase the effectiveness of their cart abandonment campaigns by using A/B testing to determine which version of an email marketing message obtains optimal lead generation and conversion results. An initial increase in effort necessitated by testing out various email versions will ultimately pay off, as the email marketer will grow to learn what contents, wording and offers best attract and motivate customers to purchase from the retail e-commerce website. For example, marketers can experiment with different sending times, subject lines and content to discovers the best combination for the retailers and its customers. Marketers should also remember to periodically update the content of the triggered emails to ensure customers will not disregard the emails in the future. Avoiding these six critical email marketing blunders can dramatically transform the customer’s experience upon opening trigger emails, while promoting shopping cart recovery and an average conversion rate of 18% through deployed cart abandonment emails. Retail e-commerce businesses implementing the above email personalization tactics can thus dramatically increase the business website’s performance and revenues, allowing the company to grow and flourish.